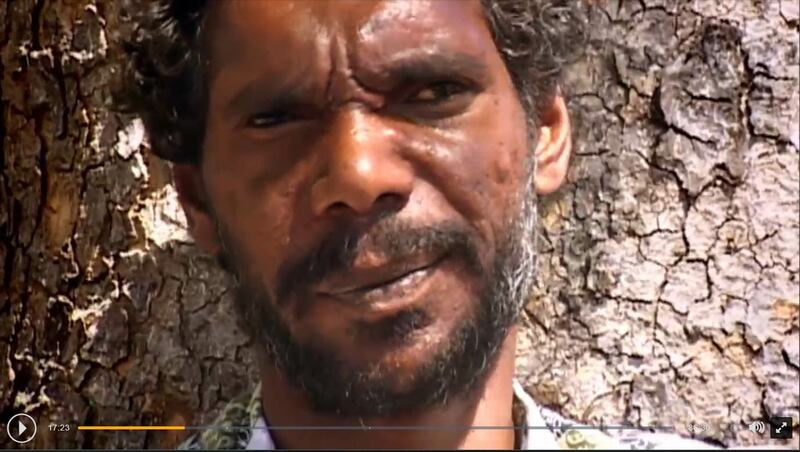 The story of Putuparri Tom Lawford , Buster, their grandpa Spider and Grandma Dolly, and the snake spirit of Kurtal in their country at the Sandy Desert in Western Australia reinforced in me how Australia’s first peoples have a salient relationship with their land. “Putuparri and The Rainmakers”–a documentary film available for viewing on SBS On Demand is multi-faceted. It shows the passing of traditional knowledge from one generation to the next amidst the complications of colonisation and the havoc it wrecks on traditional culture and its peoples. The havoc comes in the form of desecration of sacred watering holes by pastoralists to take the water from the local people and divert it for cattle, alcoholism among the people disposed of their land and alienated from their culture that is very much entangled with their land, and the slow erosion of traditional knowledge with the younger generation knowing less and less about their traditional lore and rituals, in this case for example on rituals and songs to find watering holes and to make rain. The documentary shows intricacies and complexity of making native land title claims. It was fascinating to watch how the elders can draw a map of their lands on a large canvas which got exhibited and treated with kids’ gloves like a precious artwork by the non-natives. To the natives the painting was a living artifact. It was funny how Putuparri just threw a dead bloody Turkey on top of it when he was bringing it back to Fitzroy’s crossing so that the other elders could see it. It was heart-wrenching to see the elders weep when they saw their lands depicted on the canvas. It was as if they’re mourning a part of themselves that they lost or loved ones they’ve lost. Spider talks to the Kurtal land as he approaches it to look for the watering hole. He sings to it. Burns spinifex to announce their coming. They treat the land as something alive and sentient. When Spider finds a small puddle in the ground, he instructed everyone to dig and open it up. Suddenly fresh clean water rushes from under the ground. They then do their rain dance. It’s a man’s place. After doing their rituals, they invite the women in and splashes water on them. Spider then suddenly asks that they should all leave. After they’ve left the spot, storm clouds came over and rain poured on the land. It was just beautiful to watch it in the film. I remember how my own grandfather and grandmother who were farmers in the Philippines could feel in the air when it will rain. They also could feel when is the right time to plant and the right time to harvest. This knowledge was not passed on to my father or to me. It’s quite sad. In the documentary, the elders were afraid that if no one took care of the Kurtal country, they would not be able to return to it so they can be with their ancestors after they died. This theme was picked up in the ABC TV Series “Cleverman” where the protagonist Koen had a power to blast people with a burst of light. The catch was, whoever gets blasted by this light, their soul would dissociate from their body and will not be able to return to their ancestors when they died. Koen would have to kill the person and bring them back to life in order to link body and soul once more. The Cleverman series brilliantly weaves the stories, lore and beliefs of various first peoples of Australia with a near future science fiction dystopia. It’s super cool to know that series Creator Ryan Griffen’s motivation for creating the series was he wanted his son to have Australian aboriginal superheroes, not just the global franchise heroes Batman, Ben 10, and Teenage Mutant Ninja Turtles. I found it highly interesting the series’ retelling of the story of the Hairy People, how special their genetic make-up was and how Slade (a blend of a Rupert Murdoch/ Elon Musk character) is playing both sides to exploit the hairy people with a genetic land grab and corrupt the Cleverman to give up their ancestral culture’s secret indigenous technology. The intertwined complexities of being half-white and half-native of the reluctant Koen as the reluctant next in line Cleverman and his relationship with his wannabe half-brother full-native was played out very well in the series. The documentary and the Cleverman series reminded me that everything is personal. The world and the technologies we have are created through personal relationships among peoples. Because of this, any attempt to exploit and colonise a people’s technology can only end up in disaster because the technology divorced from the people and culture who gave birth to them would most likely be stillborn. If not, it would most likely become a monster that would haunt the not only the colonised but more so the coloniser.